Phase Two of the trip kicks off with two hundred or so dolphins, and an epic fail as I attempt to go full caveman at my first authentic Kiwi BBQ. I don’t know where I got the time for that morning’s bus pick-up from, pretty sure it was from Kane the driver himself, for 7:00 am. So, I was up and ready at 6:30 and outside of the YHA at 6:55am. By ten-past; no sign. I debated walking around to the Base Hostel for their 7.15 pick-up, but if I then missed the bus in passing, I’d be screwed. So I played safe and I waited. I hadn’t told the office where I was staying in any way other than Kane’s fax to the office on Wednesday. So, then the thought that I should’ve followed it up myself via the phone, began niggling at me. I consulted the Kiwi-Experience book and it said pickup was 7:45. It was now 7:50. I couldn’t ring the office until it opened at 8:00, but I went to the hostel reception and asked them to ring for me. Sure enough, as soon as the call went through, the bus appeared magically. I didn’t mention anything at the time to the driver about how nervous that hour had been… From what I’ve learned, it is just better all round to play by the Driver’s rules. So, I sat on the front of the bus and got chatting to some people. One guy, Phil, was the spitting image of Scotty. Very weird talking to him! I’ve found that having done the rest of the trip (north to south) a lot of the new people jumping on in Christchurch (to start their New Zealand adventures from south to north) are easy to talk to, as I have experienced it all! Talking about Nevis and Skydiving usually makes a great conversation starter. The bus passengers had to be split between two hostels, as the usual hostel had a large party of divers staying over and taking up the usual rooms. The 3 Quiz guys ended up in the other hostel, but I found meeting new people fine later on due to the BBQ at my hostel. I checked in, then headed to the Dolphin Experience. I had signed up to watch the Dolphins and Dolphin swimmers from the boat, rather than dive in the water myself. It was a grim day, and the water was probably not the warmest. 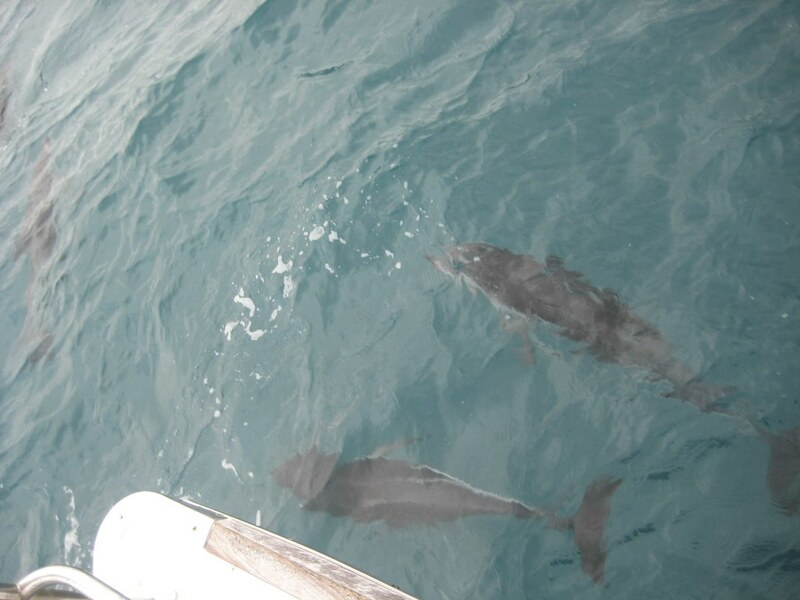 A relatively short 25-minute jaunt got us to the Dolphin’s position out at sea. There were 100’s of them, all circling the boat, or the swimmers. They were quite tricky to take pictures of, you could never predict when they would leap out of the water. I stopped trying to snap them after a while, preferring just to take in the spectacle. The swimmers went out twice, as the Dolphins gradually moved away from the boat after the first session. The Pod is apparently 2000 large, and we had a good 200 of them that day apparently. A great experience. Getting back to town, I headed to the internet cafe and killed time until about 5:20pm. I had earlier been into the local butchers to ask what time they closed. The plan was to have a BBQ that night, and I fancied something special like a steak of some kind. Odd, as I never usually liked steak, but the one I had before I left, and the subsequent ones here in New Zealand have made me a fan. However, 5:20 was still a little late, as all they had left was frozen burgers. So, with frozen burgers, a bottle of wine (still in my bag and mostly untouched) some warm beer and burger buns, I headed back. The BBQ was just warming up, and I infiltrated a conversation about beer, so I was okay from then on. Some guys had been out fishing and caught loads of fish and crayfish, the latter usually being very expensive. By the time I started cooking, it was getting dark and it had begun to rain. A very British BBQ indeed. We all ended up sat around the table, and a Swiss guy called Martin provided most of our entertainment in trying to chat up an English girl called Chloe by, bizarrely, offering to buy her as many Chubba-Chups lollies as she would ever want. The Crayfish turned up fairly late into events and there was loads of it. I tried a little, wasn’t bowled over by it, but that was no fault of the Chefs, just me and seafood disagreeing. We then headed into the town centre for a few games of pool. I ended up being quite drunk, but still retained enough sense to sneak off when I was ready. A few locals started playing pool with two of the lads, we worried a hustle may take place, but only $10 was lost, so no big deal. A good night that lead to an epic lie-in, yet again. It felt weird to meet a cool bunch of people, but then to wave goodbye to them so soon. I reckon they’ll all have fun. Because of my hour long wait for the bus that morning. I had totally forgotten about the bus almost not picking me up, and I’m sure at the time it only furthered my overall sour mood towards all things Christchurch. It wasn’t the cities’ fault of course, but I was cursing my luck, and was seriously worried that I wasn’t getting out of there! On this last stretch of the trip, I knew I had to get each bus precisely right, else I would not get back to Auckland in time for the flight back home. This wasn’t like missing the next local train – and so absolutely anything to do with the Kiwi Bus going off schedule just meant my stress levels went right up to 11! Once on the bus, it seems I got on fine talking to a few new people. In all honesty, I don’t really remember it, although I do have pictures of the “Scotty look-a-like” from that evening where we had a few beers. 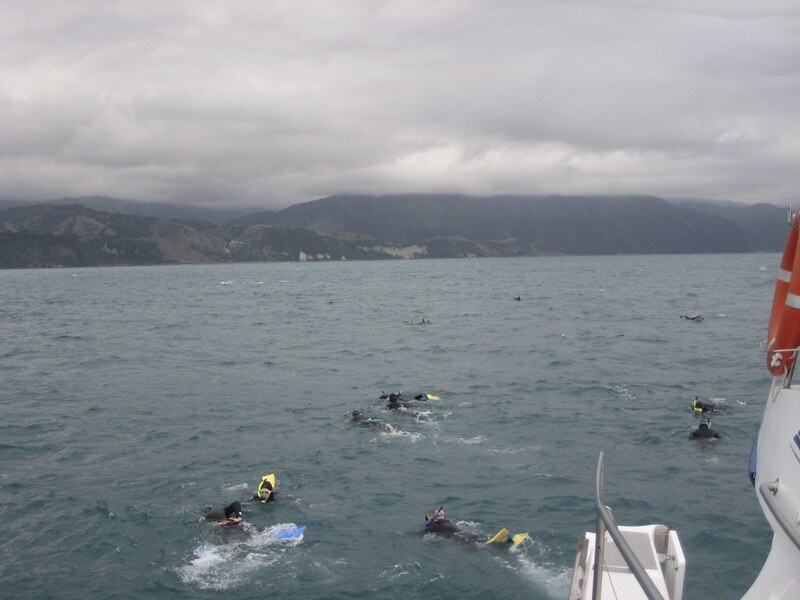 I didn’t get to see much of Kaikoura itself that day, as it was straight to business getting aboard the boat for the Dolphin experience. I opted to stay on board the boat and to take pictures, and immediately gave myself social anxiety by imagining criticism that folks may aim at me afterwards. “Why didn’t you go in the water? Why didn’t you swim with the Dolphins? What was the point of staying on a boat?” If imagining voices criticising everything you do sounds odd, then I can tell you it happens more often than I’d like. Less so as I get older and more confident, but there I was half a planet away from everyone I knew, and I was imagining phantom criticism! 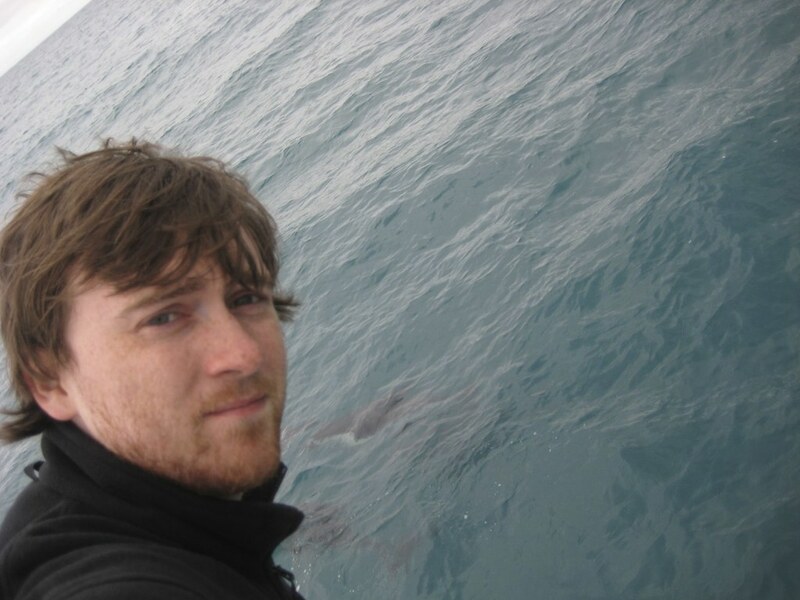 Yes, I’m sure swimming with Dolphins is a magical experience, but to save some cash, to ensure my balls didn’t shrivel in the icy water, and to make sure I wasn’t going to need a coastguard or friendly dolphin to haul my barely-able-to-swim arse out of danger, I elected to stay warm on the boat with several cups of tea. The pictures probably show that it wasn’t the nicest of days weather-wise to begin with, and so I have no regrets now about not diving in. The experience was still amazing – the sheer numbers of dolphins, and a few whales spotted not too far away, was staggering. They were very difficult to take pictures of, but mesmerising to watch. The dolphins seemed incredibly confident and curious about the gaggle of twenty or so divers from the boat who had gone out to ‘meet’ them – it must be an almost daily occurrence for the local dolphin pods, but they still seemed to enjoy the company and the opportunity to show off. Flips, spins, dives… Front row seat at the Dolphin gymnastics. One thing I do remember about that day was being told that our hostel’s owner was taking his fishing boat out. He had called ahead and the message got to our driver, who informed us that the hostel owner was happy to take “2 or 3 people” out with him to catch crayfish. Even though I don’t eat seafood, the idea of going fishing on the ocean, with a local, sounded brilliant. The idea was especially exciting as the owner was specifically going out to catch crayfish. Crayfish are super expensive in restaurants and considered a delicacy, but in this part of the world you were just able to go out and catch your own! The thought of casually catching and eating something that is ridiculously overpriced in posh restaurants, seemed a bit rebellious. I also had fond memories of the one single day I had done fishing as a teenager, back in the Barretstown Summer Camp in Ireland. I remember really wanting to do it, the idea of just chilling on a small boat with a few beers, catching fish, then barbequing it up later just sounded awesome – the stuff that great stories and memories are made of. However, it was a choice between the fishing, or the Dolphins. I wasn’t sure if I’d ever get the chance to hang out with 200 dolphins ever again, and so the crayfish boat set-sail without me. Before the dolphin experience, we did have time to check in, and I noticed the huge custom-built brick BBQ that the hostel had in its garden. Less of a barbeque, and more of a fire-pit with a giant flat metal slab that lies atop the bonfire. All the thinking I had been doing about the fishing trip had me going a bit caveman, and seeing the size of the BBQ meant that I got very ambitious about what I was going to eat that night. This was the beginning of how my vision of an authentic Kiwi BBQ transformed into a stereotypical British BBQ washout. The only meat left in the butchers to purchase were frozen burgers. It seems crazy now that I “only got into steak” ten years ago, but even then, I knew frozen meat is a sin. Everybody else was going to be rocking the best cuts of meat that the butchers had sold earlier that day, or fish that they had caught themselves. I was going to turn up with frozen burgers. To add insult to injury, the supermarket didn’t seem to have any beers in the fridge (and my memory is telling me the beer was Fosters too, but that could be my imagination) and so if the BBQ was starting in 10 minutes, I’d be kicking things off with a warm beer. By the time I got back to the hostel, it turns out half the people had already kicked off early, and so I had the monstrous fire pit to myself for thirty minutes. Warm beer, frozen meat, wearing a football shirt (I don’t follow football, and so the City shirt was old even by 2008’s standards) and wearing a pie hat. Just when I thought I couldn’t tick anything else off my Brit-BBQ-Stereotype card – it started to piss down with rain. Luckily, this state of affairs did not last long. There was plenty of food being shared around, and I managed to get some tastier bites. 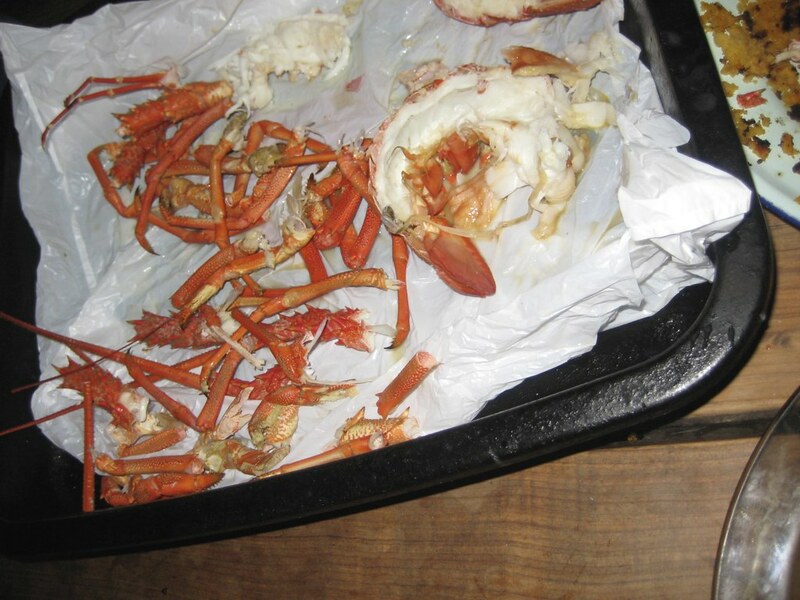 As noted, the fishermen did also return with their catch, and so we did get to try crayfish after all! I do remember deliberately avoiding the kitchen – I didn’t want to know if they were boiled alive or not, and I didn’t ask. I wasn’t the only one with that strategy - ignorance is bliss! In the end, it wasn’t that bad. I didn’t see what all the fuss was about though, nor see why these things were meant to go at £70.00 a pop. The backpacker who had caught and cooked them did say that a proper chef probably does something else to add flavour, whereas he had pretty much just boiled it up. To me, it was just a bit bland and salty, which just adds to the mystery of why they are so expensive. It must cost a lot to ship them around fresh I suppose. I also just don’t think I have the palate for seafood. We had three crayfish all lined up on the massive ‘medieval table’ that we had made by lining up the picnic tables side by side. More than enough crayfish for everyone, and it didn’t cost us a penny! Martin, the Swedish fella, provided most of our entertainment that evening. He seemed quite happy to be driving most of the humour, with his deliberately off-the-wall chat up lines and flirting techniques. This was the night I first met Chloe and co, the gang who I ended up knocking about with for rest of the trip. This was the first of two nights in Kaikoura, and thinking back, it is one of my fondest memories. These smaller towns with smaller hostels, that had very chilled out and local friendly feels to them, they all bring back very warm, very happy, very contented memories. Turtle Cove, River Valley, Nelson, and Kaikoura… Amazing places that I would love to revisit someday, to see if I can recapture the same sense of pure contentment.